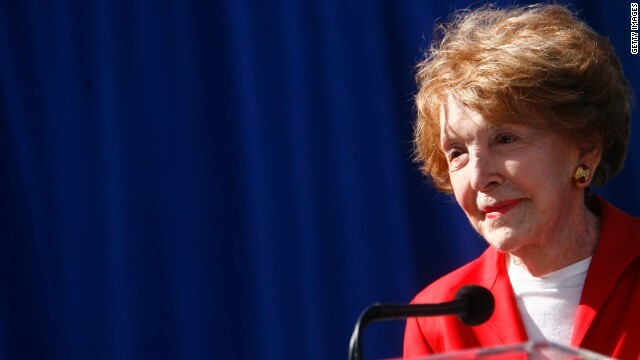 (CNN) - Nancy Reagan, wife of former President Ronald Reagan, released a statement Monday mourning Margaret Thatcher and acknowledging the close ties between the former British prime minister and her late husband. Los Angeles – I am terribly saddened today to learn of the death of Margaret Thatcher. The world has lost a true champion of freedom and democracy. It is well known that my husband and Lady Thatcher enjoyed a very special relationship as leaders of their respective countries during one of the most difficult and pivotal periods in modern history. Ronnie and Margaret were political soul mates, committed to freedom and resolved to end Communism. As Prime Minister, Margaret had the clear vision and strong determination to stand up for her beliefs at a time when so many were afraid to "rock the boat." As a result, she helped to bring about the collapse of the Soviet Union and the liberation of millions of people. Ronnie and I knew her as a dear and trusted friend, and I will miss her. The United States knew Margaret as a spirited and courageous ally, and the world owes her a debt of gratitude. My heart goes out to Mark, Carol and the entire Thatcher family. My heart goes out to the whole intire thatcher family, may god bless the thatcher family. Very endearing remarks from the former First Lady regarding the personal relationship between her late husband and Mrs. Thatcher. Both were true leaders of their respective countries and obviously had a great deal of respect for one another, as well as a shared ideology. The press and the public as well are often time unkind in their remarks and assessment of public figures, but history is the only true measure of their ultimate contribution and committment to their vision. our country needs a woman like margaret thatcher right now. heck, when you get right down to it, every country needs a woman like margaret thatcher right now. the socialist disease is threatening the entire planet, killing entire countries. "Political soul mates" huh? I think of them as partners in crime. We should never forget the damage done to our country by Reagan, including the Iran/Contra scandal and the vast expansion of the national debt. In addition, he killed off unions and began a process of shoveling the wealth of the nation into the hands of the 1%. As for Thatcher, her closest aides, including Jimmy Savile, were heavily involved in child abuse. That was on top of all the middle class killing policies that promoted more class divisions and the stranglehold of the rich over the poor in Britain. Well, that statement says it all doesn't it? SNancy Reagan has spoken and as usual, Ronnie was a god sent here to save us all only he died and lost his mind before his mission was accomplished. Did I get it right Nancy? She was the closest England ever had to a pure dictator. I can see why she got along with the Reagan's and Shrubs. Peas in a pod - all of them. Margaret Thatcher, Ronald Reagan and Lech Walesa were giants who had the courage to stand up to communism. Margaret Thatcher was the most evil woman of the twentieth century and her son did not fall far from the tree. Fortunately, karma disposed some justice in the form of the last 10 years of her life being spent in physical torture while she saw her son exposed for his crimes in Africa. This truly was a golden era – where strength of character, truth, loyalty, and integrity were the beacons that guided our leaders. Now, we just have community organizing, dvision among everyone, lies, and trash. We can return to a better way – our current leadership is totally unacceptable. I suppose that's one way of describing their mutual lack of a soul. Thatcher was just another right wing nut, same as Raygun. A pox upon both of them. "she helped to bring about the collapse of the Soviet Union and the liberation of millions of people." Please. Russia still leans fascist. They're currently trying to pass legislation criminalizing public events and dissemination about the gay community, with fines of like $16,000. That kind of prior restraint would fail under the 1st Amendment with a SCOTUS decision barely 3 pages long. Putin's visit to Amsterdam is about to face protests from the gay community there as a result. NOBODY IS FREE UNTIL EVERYONE IS FREE. One assumes your comment is based more on fiction then actual on reality. The Reagan years will never go down in history as a golden era. Certainly not for those of us old enough to have lived during the Reagan years.